Disk Station DS1515 - ACE Peripherals ::: Completing I.T. High-performance and reliable. Ready for your growing needs. Featuring a quad-core processor, hardware encryption engine, and floating-point unit, DS1515 is a powerful, expandable 5-bay NAS server that delivers outstanding data transmission speed. With built-in four Gigabit LAN ports featuring failover and Link Aggregation, plus High Availability and SSD read/write cache support, DS1515 offers the reliable storage solution at a cost-effective price point for your growing needs. The performance figures vary on different environments. Synology is dedicated to continual performance enhancement. DS1515 is equipped with a dedicated hardware encryption engine, delivering encrypted data transmission speeds over 296.54 MB/s reading and 150.04 MB/s writing with Link Aggregation enabled. DS1515 also features a built-in floating-point unit which enhances the overall capability of the main CPU to enable higher working efficiency. Equipped with four Ethernet ports featuring failover and Link Aggregation support, Failover support ensures continual network uptime even if LAN connection malfunction occurs on one port, reducing the chance of service disruption and costly downtime. Link Aggregation improves connection speeds beyond the limits of a single network cable or port. As your data storage needs grow, DS1515 can be connected with up to two dedicated DX513 expansion units2 for additional storage on the fly, growing capacity with minimal effort. With two DX513 connected through cables with specially-designed locking connectors, raw capacity can be as high as 120TB3. 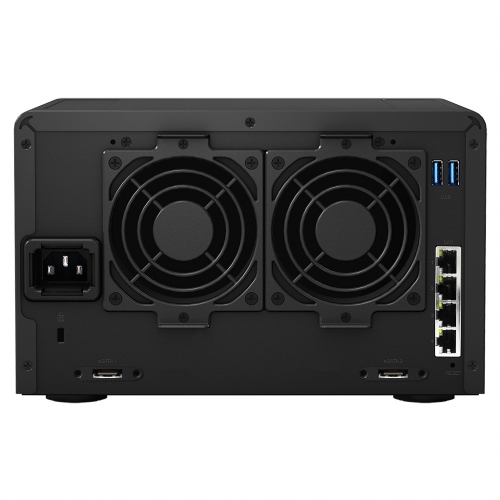 DS1515 supports up to two Synology DX513/DX213, sold separately. DS1515 boasts USB 3.0 and eSATA ports to connect to various kinds of external storage devices, while ensuring fast and efficient file transfer speeds. Support for USB 3.0 offers transfer speeds of up to 5 Gbps (about 10 times faster than USB 2.0), meaning it takes less time to transfer data to external hard drives, while also consuming less power. With the support of Windows AD, LDAP, and Domain Trust, DS1515 enables seamless account integration. The User Home feature can automatically create a "home" folder for every user account to minimize the administrator's effort in repeatedly creating "home" folders for all accounts. Windows ACL support on DS1515 allows IT administrators to fine tune access controls and set up privileges to files and folders on DS1515 through the familiar Windows user interface. With compatibility for major protocols, DS1515 can eliminate server configuration overhead and enhance IT administrators’ efficiency. Uninterrupted availability is a critical goal for all businesses. 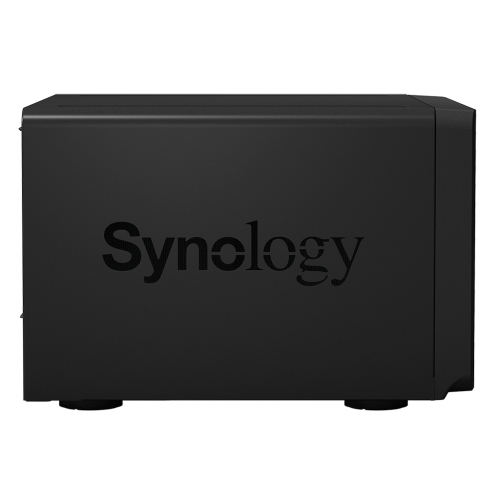 DS1515 supports Synology High Availability (SHA) technology which combines an active and passive server into one cluster, the former always mirrored to the latter. The Heartbeat mechanism detects regular "heartbeats" between the two servers. If the main server encounters unexpected downtime, the passive server immediately takes over. With multiple LAN ports, DS1515 also ensures redundancy in the event of unexpected network failure. 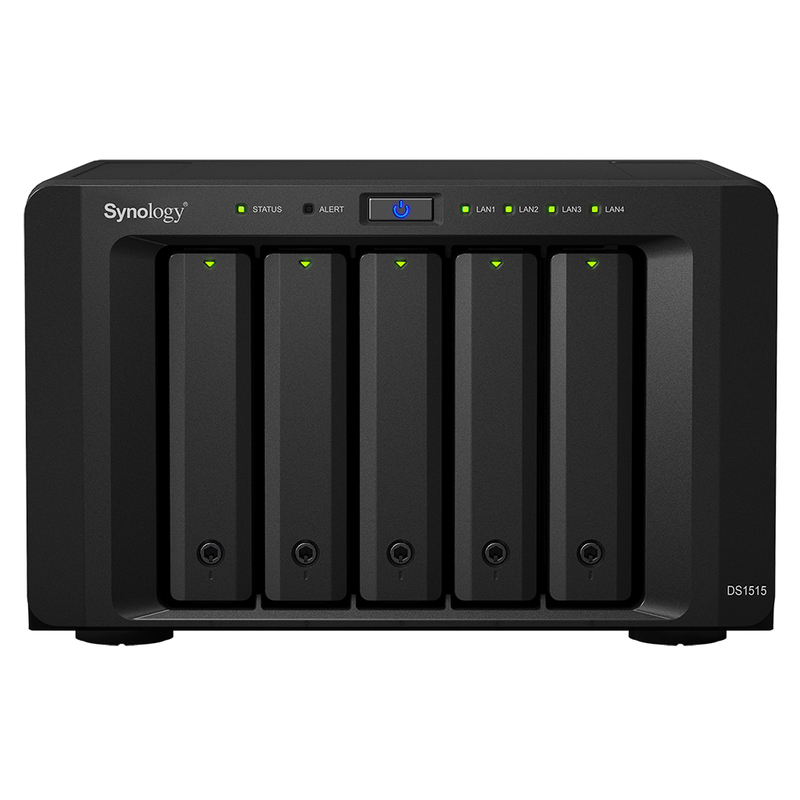 Synology DS1515 can serve as a centralized backup target. Whether you are a Windows or Mac user, you can back up everything on your computer directly to Synology NAS using Cloud Station. Whenever you modify a file, the changes are backed up to DS1515 automatically. Mac users also enjoy native Apple® Time Machine support. You can also back up data from your DS1515 to another DiskStation, rsync servers, external drives, or even Amazon® S3, Glacier cloud service, Microsoft Azure, SFR, and hicloud. "Backup & Replication" allows you to schedule backup tasks and restore the server to any particular point in time, while minimizing storage consumption and processing time by saving only the specific data block that has been changed between versions. With comprehensive cloud solutions, DS1515 lets you create your own private cloud easily. Cloud Station is the perfect package to sync files across multiple devices. Files can be edited in offline mode and later synced to Cloud Station, which keeps up to 32 historical versions, allowing you to restore a file back to previous version or recover deleted files. With the mobile app DS cloud, any change made to a file is automatically synced to your smartphones and tablets. For distributed enterprises, Synology's 2-way sync between different DiskStations ensures employees at different locations share the same information in real-time. IT administrators can handpick individual folders that they want to sync to different devices, manually or automatically based on file format and size. Folders synced by Cloud Station can be encrypted on DSM — no one will be able to access its content without your private key. All Synology NAS is designed with energy efficiency in mind. DS1515 only consumes 18.2W in HDD Hibernation and 32.3W in access. The support of Wake on LAN/WAN and scheduled power on and off can further reduce power consumption and operation cost. Synology acknowledges the responsibility as a global citizen, so all Synology products are produced with RoHS compliant parts and packed with recyclable packing materials. DiskStation Manager is an intuitive web-based operating system found on every Synology NAS. It’s been designed to help you manage your data: documents, photos, music, videos and all other important forms of digital assets. With DiskStation Manager, it’s more than just storing data. DSM offers a various range of applications and services to bring more entertainment to your home life as well as better productivity at work. The ability for users to access and share digital files is the core functionality of a NAS. Thanks to its great compatibility with Windows®, Mac®, and Linux®, DiskStation is the best medium for any types of file storage and exchange. The majority of people now switch between multiple devices every day, resulting in a dramatic increase in the popularity of cloud storage. Sometimes our entire productive life — working reports, notes, references — relies on the cloud, meaning we need a cost-efficient, high-capacity yet absolutely private cloud solution more than ever. Synology offers all of these, and more. Go out and collect beautiful ideas in your digital notebooks. As you come and go between home, office, or on business trips, relax and find your files synced across all devices. A private cloud can help you do so much more. Synology’s storage solutions have been designed to help you manage your digital assets. There is a suite of added-value packages to facilitate business daily life, flexible administrative options, as well as tools to secure your DiskStation and valuable data. Applications that used to require dedicated servers are unified on DiskStation. It’s a cost-efficient all-in-one server for start-ups and large scale businesses. Server management stays simple on DSM, regardless of the amount of units you own. Managing rows of servers is just as easy as managing one. Synology developed many tools related to various storage solutions, helping all users to meet different storage demands. Your server stays on top performance at all times. We all have data that we don’t want to lose. That’s why you should make DiskStation as a backup destination. Your files will always be available. You need affordable storage designed for a virtualized infrastructure that’s easy to manage, supports continuous data growth, and keeps your business up and running. Learn how DSM meets the need for simplicity and flexibility in today’s virtual datacenters. In businesses where 24/7 service is paramount, DSM offers series of high availability and security measures to safeguard you from unexpected server disruption and data loss. Whether it is live TV shows or songs stored in DiskStation, enjoy seamless streaming anytime anywhere. It’s an ideal online album to store and share pictures with your loved ones. DiskStation Manager is an open source platform with a variety of packages, making your DiskStation fit into any kind of environment. From being a hi-definition multimedia center, to an all-purpose business server, there is a package to meet your requests. Want to know what packages we offer? Find out in the Package Center. DiskStation Manager is a great development platform. Become part of the development community today. DSM 6.0 is an intelligently engineered and reliable data storage platform that comes with a completely private collaboration suite. Exciting virtualization technologies are designed to benefit the next generation of businesses. Get these and much, much more with DSM 6.0. The all-new MailPlus and MailPlus Server packages allow your business to set up a secure, reliable, and private mail server while giving your employees a modern mail client for receiving and sending messages. Best of all, MailPlus and MailPlus Server run on your Synology NAS, so there's no need to rely on third-party services. Keep absolute control over your data privacy. Whether you're calculating prices for a customer or keeping track of household expenses, having a spreadsheet makes it much easier to collect and organize data. With the new SpreadSheet package, you can create, edit, and collaborate on spreadsheets with other people. In addition, Note Station lets you and your team accomplish even more tasks with new features, such as charts, presentation view, mail clipper, and much more. Save your documents in Synology NAS servers － collaboration is easier and safer than ever! Flexible enterprise storage solutions now offer greater support for SSD cache, ensuring a significant boost in business performance. The new PetaSpace package allows for creating shared folders with over one petabyte of storage space while Btrfs file system is now supported on more Synology NAS models with a number of new and enhanced features such as Data Compression and Data Scrubbing. Enterprises need an efficient data protection strategy to eliminate the risk of data loss. With the introduction of Snapshot Replication, DSM 6.0 provides businesses with near-continuous data protection, as well as multi-site replication for more comprehensive protection. 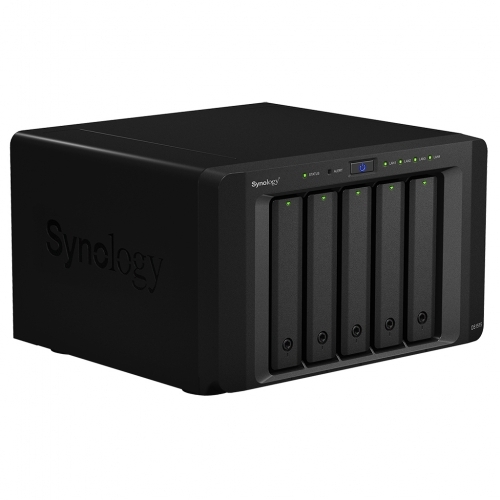 In addition, the Synology Hyper Backup package can now perform multi-version backups to all types of destination. Today, organizations need to accommodate rapid business growth with minimal hardware investment. DSM 6.0 introduces Docker DSM and Virtual DSM, enabling businesses to consolidate multiple physical servers with virtualization technology and build a reliable, multi-tenant environment on Synology NAS. No matter what device you use, it is important for your files to be available at all times. With the Cloud Station Suite, it's easier than ever to synchronize files across multiple devices and build your own private cloud. 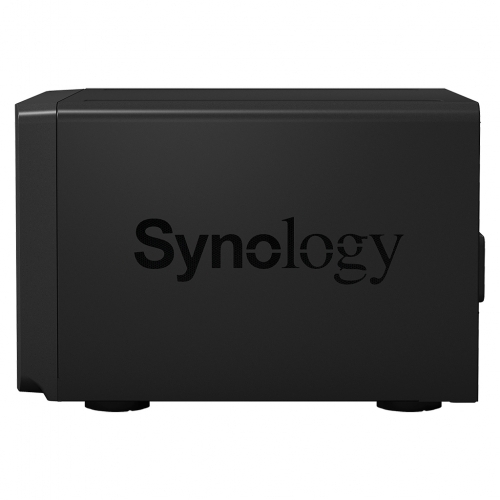 In addition, Cloud Sync offers more precise controls for syncing or backing up files from your Synology NAS to a host of cloud storage services. In DSM 6.0, Synology focuses on optimizing your multimedia experience with thoughtful and powerful features, as well as integrating popular third party devices and applications. The redesigned Video Station with offline transcoding allows you to watch movies anytime, anywhere. Multimedia mobile apps support multiple devices including the new Apple TV, Apple Watch, and Windows 10, ensuring smooth experience anytime, anywhere. To help protect critical data and other assets, DSM 6.0 brings new management and security tools so Synology NAS can serve as the heart of your network strategy. Tackle authentication challenges with DSM 6.0's support for the 802.1X protocol, or save time and energy when executing your SSL strategy thanks to Let's Encrypt integration. Synology empowers you to achieve more while reducing time and resource consumption. DSM 6.0 introduces a powerfully comprehensive, yet extremely efficient search feature, allowing you to quickly reach all your data. Running on all servers compatible with DSM 6.0, DSM's full content search indexes more than 700 file formats including office documents, and covers metadata of media files for an even more in-depth search experience. With every version of DiskStation Manager, Synology strives to bring the most forward-thinking features and intuitive usability to the world of network storage and serving. 64-bit architecture DSM 6.0 switches to 64-bit computing to ensure you always benefit from the most popular and efficient architecture, in a completely transparent fashion. 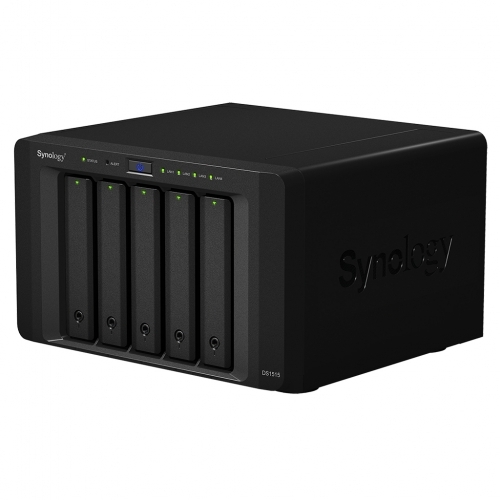 This allows your Synology NAS to process tasks more efficiently so you can do more in the same amount of time. In addition, 64-bit architecture increases RAM capabilities on new Synology NAS models in the future. Modularization With DSM 6.0, Synology delivers a leaner system architecture by modularizing a greater number of non-essential applications. Separating more applications from DSM brings numerous benefits, such as maximized uptime by reducing unnecessary system updates, flexible development of individual applications, reduced patch size, lighter system burden, and much more. Accessibility One of Synology's core beliefs is that advanced storage and applications should be easy to use and available to more people. That's why DSM 6.0 introduces new accessibility features to help visually impaired users navigate DSM, manage files in File Station, and change settings in Control Panel using screen reader software NVDA and Firefox.